I had the pleasure of having my 5 year old granddaughter for a girl’s day, and we decided a Valentine craft was just the right way to spend the afternoon. 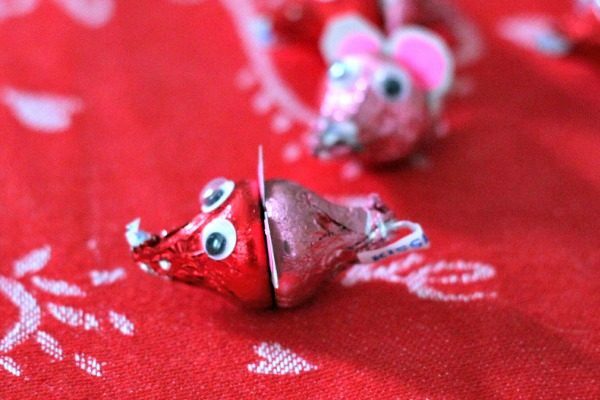 I’d seen this cute little Chocolate Valentine Mice Craft on Pinterest and knew she would LOVE it. And boy was I right about that. We purchased a package of Valentine Hershey’s Kisses, some small googly eyes in the craft section of Walmart, gathered some color construction paper and glue, then went to work. First you’ll cut out some small circles in gray (or whatever color you choose) about 2 cm across for the outer part of the ear. Then cut out more small circles for the inner part of the ear, in pink. These will be about the size of an eraser head. This is where grandma came in handy, because little 5 year old hands didn’t quite have the dexterity to cut those little circles. Grandma wasn’t so hot, either, but precision wasn’t a key element. Now glue the small circle to the center of the large circle and give it a few minutes to dry. While the ears are drying, cut off the pull paper from half of the Hershey’s kisses. Leave the remaining pull papers on the other half, as these will act as the mouse’s tail. for a few seconds to make sure it will stay in place. I had to go back and press the two kisses together, to make sure they were firmly glued. Lay them out to dry. Once they are dry and can be handled without coming apart, it’s time to glue on the the googly eyes. Place two dots of glue on the upper side of the nose part of the Kiss, then dampen your finger tip and pick up an eye and stick it on the dot of glue. The 5 year old loved this process and quickly learned that a dampened fingertip did wonders in picking up each little eye. Once all the eyes are glued on, let the whole thing dry. Go back every now and then and make sure the two Kisses are firmly glued to each other. Once I did a few with my granddaaughter watching, she was able to complete the whole process herself, other than cutting out all the tiny circles. A tip for cutting out the circles – fold your paper in fourths and cut out 4 at a time. Gift these cute Chocolate Mice, or just set them out as decoration, before devouring of course.